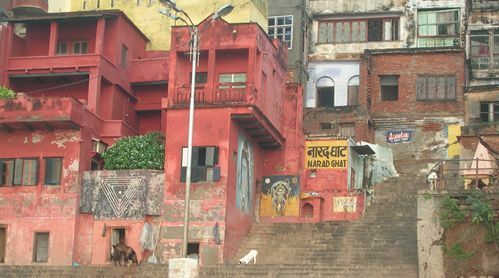 INDIA TODAY reported that Heidi Klum and her man called “Seal” have invited a Varanasi pandit to celebrate their third wedding anniversary. This man, Shailesh Tripathi, said the mag, conducted a “Ganga Puja” for them when they visited Benares last year. Tripathi also showed me round Varanasi last year, but I wasn’t offered “Ganga Puja”. He had an intriguing explanation for a large painting of a Kali Yantra on Narad Ghat which we noted, with interest, and some scepticism. He also took me to a Durga temple where they don’t sacrifice goats any more, but merely nick the ear of the male to draw blood, he said. Durga is fond of blood sacrifice, but they all have to be male animals. The head of the unfortunate creature is supposed to be severed with one blow. Formerly, human sacrifice was performed, but the folks have it the animals for sacrifice represent peculiarly male characteristics, such as greed for tom cats, lust for billy goats, and pride (ego) for men. The idea, according to the Bengali Karpuradistotra, is the real sacrifice of these characteristics inside yourself, not beheading poor creatures. This entry was posted in Uncategorized and tagged Durga, goats, Heidi Klum, Kali Yantra, Kalika, Karpuradistotra, Narad Ghat, Seal, Shiva, Tripathi. Bookmark the permalink.